How to make an anchor: it's been an amazing weekend in the People's Republic of Hillswick: My neighbour, blacksmith Bruce Wilcock, has masterminded the hand-forging of a full-size naval anchor, using Victorian technology. 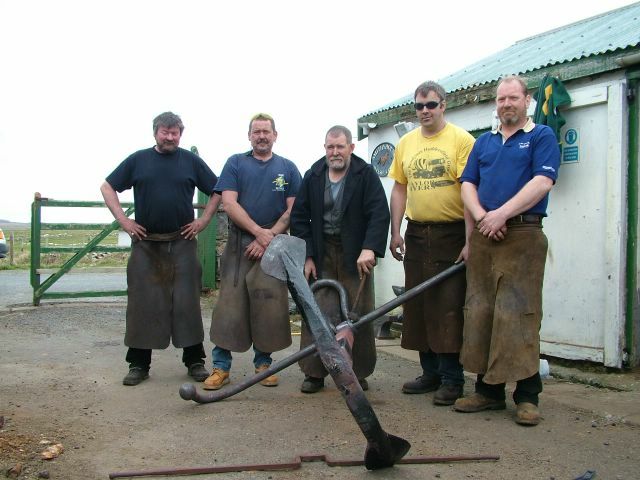 The local Amenity Trust paid for three top Yorkshire blacksmiths to come to Shetland, and with Bruce and a local Shetland smith, it took just three days to make the anchor from odd pieces of scrap and salvaged iron. A DVD of the entire project will be available in due course, but this is the completed anchor, with the guys whose muscle power made it. Welding takes on a whole different perspective when it's done by several men wielding hammers on white-hot metal. Pictured: (l to r) Michael, Mark, Bruce, Ian, David. I know the Labour candidate likes dogs, because he was in our house the other day, and gave Quoyle the (now rather stinky) black Labrador a cuddle. And the cat. I did not allow him to cuddle me. 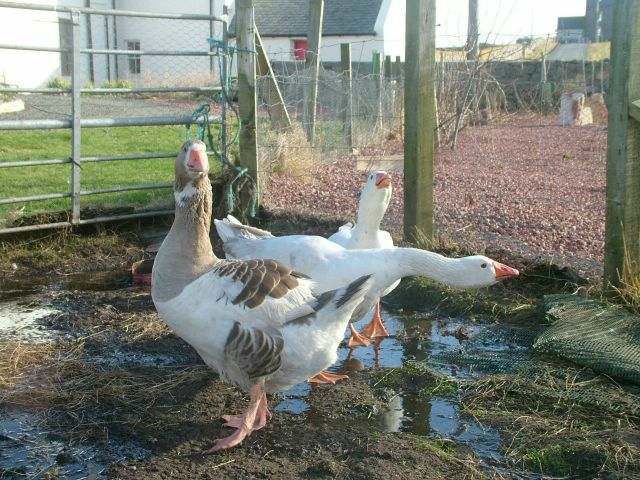 The Great Beasts of Hillswick are absent at the moment, one of them to breed more and greater beasts, the other in training not to nuzzle shamanistic beaters of bongo drums. Otherwise it would have been useful to see how Richard Meade reacted to St Bernards in full slobbering mode. I would assume that pet-cuddling is part of the training process candidates of all parties go through, even the Revolutionary Trotskyist Scottish Socialist Not Tommy, No Sunbed, Mostly Teachers Faction. For some reason I think of these revolutionaries as throwing manly embraces of brotherhood around the necks of Lulu, the soon-to-return, (slightly) stupider St B, and stoically bearing the great globules of spittle as Leon himself would, like they were ice axes. Melted ones. Is there a Tory? One must assume there is one, somewhere, but presumably both he and the UKIP fellow will want to see the Labradors sent back to Labrador and the St Bs forcibly repatriated to Switzerland, despite the fact that they were of course born in this country. Partly because of the compulsory tweeds, I can’t see these right wingers coping with the drool terribly well in a political clinch, though the UKIP chap’s name suggests a familiarity with such situations. Officer Dribble, indeed! Nats and Nugents I have noticed, doing their thing, but nowhere near canines. I have of late, after rather too much strenuous exposure to giant breeds, taken a shine to Scotties, and even the shamefully tamed and gentrified Shetland sheepdogs, but lapdogs in the end of the day tend to poo or pee in the most inappropriate places. Like laps. That leaves Alastair, of course, of the Carmichael Party. And he could be forgiven a self-satisfied smile, because he has this election more than sewn up for the Carmichaels. The fact that he is allegedly a Charlie-Libocrat is of no importance or interest to anyone, really. He is such a good guy, with his heart in so many right places, it feels like a personal insult to even think of voting against him. And it is absolutely certain that he, for one, will not send the St Bs back to dodge avalanches, or Labradors to fetch fishing floats from the icy Canadian ocean. Having returned, restored and refreshed (once the food poisoning wore off) from the Lake District, I have become obsessed with mountains. Or, seeing as we’re in Shetland, hills. Well, to be strictly accurate, little lumps in the local landscape. These sceptr’d isles are not known for their soaring heights, except when it comes to cliffs, but it strikes me that our peerie hills are, in some cases, rather good ones, and that they should be celebrated. Also, they should be climbed, and the fact that (a) none of them are very high, and (b) many can be accessed from roads or tracks which go a fair way up them, makes them appealing to the kind of hillwalker whose knees are beginning to squeak alarmingly unless WD40 is inhaled in massive quantities. People like myself, in other words. Now, elsewhere in the UK hills are classified according to their height. In Scotland alone there are Munros, Munro Tops, Murdos, Murdo Tops, Corbetts, Donalds, Donald Tops and Grahams. Munros, top out at more than 3000 feet, Corbetts at 2000 ( I think) though there are complex calculations involving peaks on the same ridge. It struck me (in a quiet moment) that it might be fun to evolve a system of peak-classification for Shetland, and to that purpose I have been poring over maps. As I prefer feet and inches to metres and whatever else goes with them, I favour the Ordnance Survey Popular Edition One-Inch maps of 1928 and 1948, and I would point out that this is a work in progress, so please – your suggestions, corrections, insults and metaphorical slaps about the chops. First, the height. I think 800 feet has to be the cut-off. Anything smaller is just too, well, low, though I am aware that this leaves both Yell and Bressay absent from what I am provisionally calling the list of Peerie Muckles. Though as you will see, I am also fiddling it a bit. And I’m inclined to include a couple of coastal cliffs, just because they are so extremely….high. Mainland: Fitful Head (928 feet); Ward of Scousburgh (863 feet); Royl Field (also on some maps just as Bonxa Hill) (960 ); Muskna Field (858); Sandness Hill (817); Scalla Field (921); Gruti Field (841) Bratta Field (834); Hill of Dale (797 – I know, I know. But it’s only a yard in old money) Weisdale Hill (no height on my maps, but over the 800 foot contours). Then the biggies, all in one massif: Ronas Hill (1475) Mid Field (1273) and Roga Field (1201). The isles: Shetland’s second highest peak is on Foula, where the Sneug soars to 1373 feet. But having made the trip, it has to be worth peering over the Kame, at 1220, it being the highest sheer sea cliff in Britain. And finally, there’s Saxa Vord in Unst at a surprising 934 feet. I’m tempted to throw in the Ward of Otterswick in Yell (672) and the Ward of Bressay (743) as Mini-Muckles. But 15 Peeries seems a like a good figure to me. The glory that is Center Parcs...or at least, the food. We went to the Lake District for our (late) Easter holidays, and I rediscovered the wonders of Keswick and Derwentwater (every childhood Easter holiday, I was taken there). We stayed at the Oasis Center Parcs complex near Penrith, which is, on the whole, excellent in a bourgeois Butlins sort of way. Lots of really well supervised activities, nice swimming complex, fine accommodation. But oh dear, the restaurants! Awful. The most expensive "Indian" restaurant in the world. And, for your delectation and delight, 16 ounces of horribly fatty burger, enjoyed, admittedly, by my 17-year-old son. My big, biggest, most debilitating problem was food poisoning, incurred at a Penrith spa hotel just before going to CP. 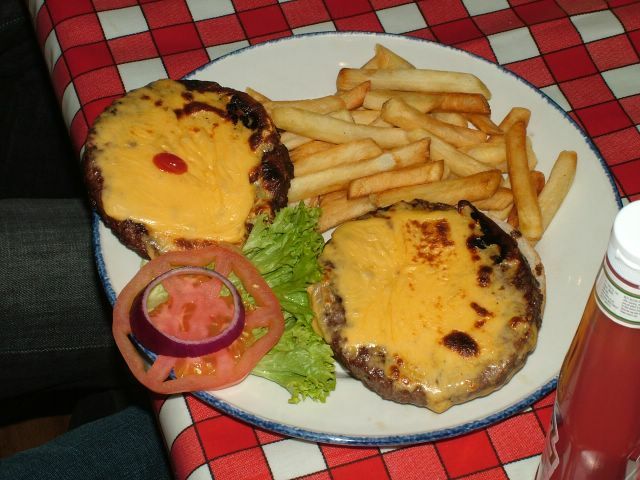 It lasted the entire week, and when I attempted to eat approximately half the quantity of burger my son had, the result was my first bout of vomiting in five years. Lovely. Meet Lunch, Dinner and Omelette. One goose and two ganders. Not that we knew they were ganders when they arrived. Lunch and Dinner have only been joined by Omelette recently, and seem a bit bamboozled by female company, to be honest, preferring to strut and posture, intimidate the hens and screech at every passing car. No eggs from Omelette as yet, but we live in hope. Grangemouth is a wee bit like a neat, cleaned-up, early-seventies version of the steeltown that forms the backdrop to the first half of The Deerhunter. The (formerly) BP chemical plant and refinery doesn't so much overhang the place as occupy a great chunk of it. And at night it is truly spectacular. I'm astonished it hasn't been used for a whole swathe of Scottish crime films/pop videos. It's the New Jersey shoreline of Scotland. I was there as part of BBC Radio Scotland's year-long Soundtown initiative, and we broadcast the TM show live from the studio set up in Grangemouth High School. Then at night it was time for the TM Roadshow, featuring the excellent Aberfeldy. Check out pictures (by my old mate Stewart Cunningham http://www.stewartcunningham.com/) and stuff at http://www.bbc.co.uk/scotland/radioscotland/view/show.shtml?tom . Things went well, for the most part. Aberfeldy (http://www.aberfeldys.com/) were splendid. Only real disappointment was the fact that Lindsay Hutton (of the wonderful blog/newsletter/site Next Big Thing http://nextbigthing.blogspot.com/ had his car trashed in the school grounds. Very unpleasant and very unfair too, considering Lindsay is a GHS FP and still lives in Grangemouth. Back home on the boat, crazy Saturday with a silver wedding in the Ollaberry Hall to finish the day, almost. Truly phenomenal buffet. I mean, stunning. Only Shetland communities can do such things. Actually, only Ollaberry. It would have been nice to finish the evening in a haze of sticky toffee pudding and dark rum, but weans were scattered across the islands, and they needed collecting. I think my eyesight is disintegrating. Driving after dark is a real hassle nowadays. Still, safely home. The St Bernards, Dumb and Dumber, are off for their holidays in Yell, which is a relief for me, especially as there was yet another incident where Dumb (in a frenzy of protective slobbering) scared the wits out of one of our less amenable neighbours. Again. Fourteen stones of St B approaching at high speed, jowls aquiver, is, it must be admitted, an intimidating sight. Thinking back to my rail trip down from Aberdeen to Polmont (nearest station to Grangemouth), that Fife coastline just north of the Forth Bridge is another natural for obscure and dastardly filmic doings. All those one-boat harbours, scrapyards and strange caravan sites. Time to get back to The Novel, methinks!